A call for an impromptu get-together for snacks and drinks at a neighbour’s place upstairs motivated my trial of my mother’s zucchini bread recipe. 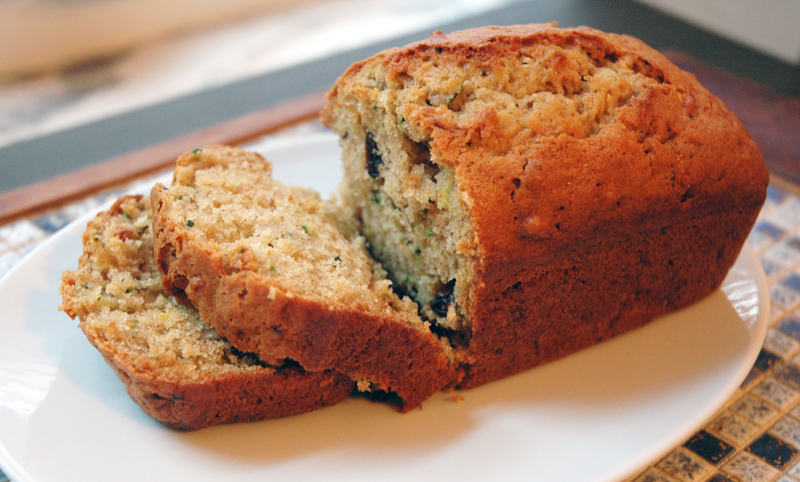 Now, I’d never really thought of zucchini as something to go into a tasty baked product, but I’ve always adored zucchini bread. And it’s actually a fairly simple recipe, mixing wet and dry ingredients before folding them into each other. The prep time is quite minimal, which is helpful when trying to throw something together in a hurry. Preheat oven to 350 F. Beat eggs well. Gradually beat in sugar, then oil and vanilla. Stir in zucchini. Mix or sift together dry ingredients. Stir into zucchini mixture along with nuts and raisins. Pour batter into 2 greased 8″ x 4″ loaf pans. Bake for 50 – 60 minutes. Let cool in pan for 10 minutes, then turn onto wire rack to cool completely. A few notes on preparation: For whatever reason, the two loaf pans that I have are smaller than 8″x4″, so I ended up making two loaves and then pouring the excess batter into muffin cups. As the recipe didn’t specify what sort of chopped nuts I needed to use, I went with walnuts (as that’s what I had on hand). In the end, the bread turned out well…moist and flavourful. It went over well at the party, with one of the guests taking half the loaf home at the end. Must’ve been OK then! UPDATE 01.06.12 – a half-recipe was just right to fit my 5.5″x3″ loaf pans.